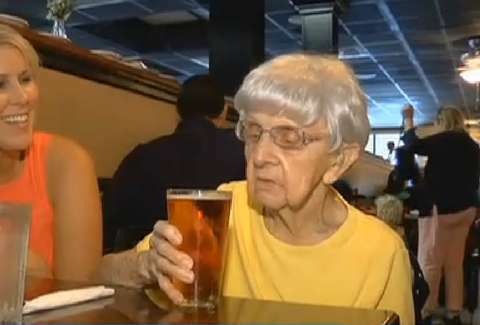 Mildred Bowers of Mount Pleasant, SC, celebrated the big occasion a little early at a local restaurant last Friday, where friends ordered her a pint of her favorite beverage, according to a report by area news station WCSC Live 5 News. Known as 'Millie' to her friends and family, the centenarian wasn't shy about her secret to longevity. "Have a beer," she said in an interview. "Doctor's orders." And it looks like she tends to follow her own advice. Bowers is allowed to enjoy a cold one every day at an assisted living facility. When asked if she recommends other seniors drink beer on the regular, she said, "Yes, if they like it," according to the report. Although she also attributes her long life to good genes, it sounds like the senior facility is going to need a keg soon. She turns 103 on August 31st. Bowers joins several other seniors who have attributed their longevity to booze, like Grace Jones of England, who, when celebrating her 109th birthday late last year, said she has a "drop of whiskey every night." And lets not forget the 110-year-old New Jersey woman who swears by drinking three Miller High Lifes and a shot of scotch every day. This might be wishful thinking, but maybe they're onto something, guys. Cheers. Check out the full interview with Bowers over at WCSC Live 5 News. Tony Merevick is Cities News Editor at Thrillist and will probably live forever at this rate. Send news tips to news@thrillist.com and follow him on Twitter @tonymerevick.